I have some Hornady 40gr V-max bullets I want to load up with Ramshot TAC powder. Any recommendations for an accurate load? I have a S&W AR15 with a 16-inch barrel and 1:9 twist. I just loaded up 15 cases. 3 each at 25.8, 26.2, 26.6, 27.0, and 27.4 grains of TAC. Hopefully this will give me a peak at what the optimum charge weight will be. Just loaded up 15 cartridges. Ramshot list the min at 25.1 and the max at 27.9. I spread them from 25.8, 26.2, 26.6, 27.0, and 27.4. Hope that is enough to find the optimum charge weight. Slimjim, that may be enough. When I use the OCW method of development, I generally load up four rounds for each specific charge weight. The reason being that if you have an obvious pulled shot you will have another round with that charge weight to re-shoot it. If I don't have to use the extra rounds, I'll just go ahead and pull the bullets. Have fun with your load development. I know what you mean about 4-round groups. They are more reliable than 3-shot and in many ways as good as 5. I was limited to 15 cases so just stuck with 3 for now. When I have a good load in my AR, it patterns 3 shots nicely. My buddy is using Tac for his Ar I will check with him but im not sure he is shooting bullets that light. Here are the results of 3-shot groups from 25.8, 26.2, 26.6, 27.0, and 27.4. I superimposed the five groups over the POA. Groups go from dark green (25.8), to teal (26.6), to deep blue (27.4). 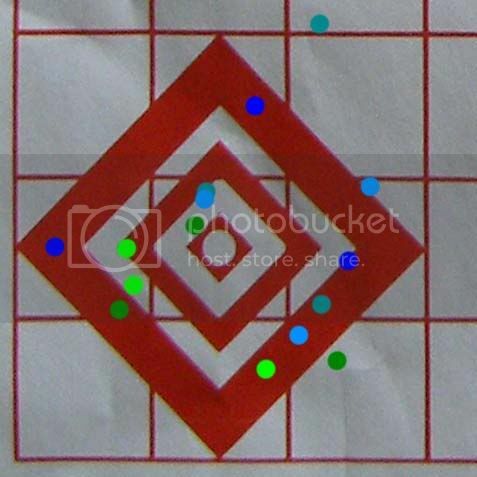 Not that happy with the groups and not as good as the 40gr VMax Fiocchi ammo that shoots 0.75 MOA. Looks like the optimum charge weight is near 26.2gr for TAC. Think I'll load up 26.0, 26.2, and 26.4 and see how they print. If this doesn't get me under 1 MOA, I may have to try this again with Varget and H4895. I should be able to do as good as the Fiocchi. Have you tried any Winchester 748? for lighter bullets. I use this for 50-55 grain bullets with good results. From my 20" iron sight AR 52 gr. HP match bullets and 55 gr V-max are both under 1moa for 10 shots... all ten shots. I use 26.5 grain for a target load and 28.0 for a hunting load. i am in Lousiville right now and do not have my chrono data but IIRC - about 2900 fps and 3200 fps. Your bullets are too light!!!!!! Go up to the 62gr and and above, and you will see those groups decrease down to a good size. Try the 75gr Hornady BoatTailedHollowPoints!!! And yes these can be loaded to AR magazine length. I think I put about 22.5gr of TAC into the cases for dad's Bushmaster Varminter. It also has the really fast rifling. And there is no way his will reliably group sub-55gr bullets. 55's are not real good but will do minute of coyote. The 62's and up are where this twist REALLY comes into being a tack driver. which ones are the light blue I see 5 colors and you only listed 4 unless I am missing something. Are those the 27's It seems like that shows the most promise It may be time to adjust length some times they like to jump more then you would think try making a shorter overall length. especially if they are coming out of a mag. Your bullets are too light! I just happened to have some 40gr VMax's laying around. Also, I've been shooting the 40gr VMax in Fiocchi ammo and it does real well. I only have a 1:9 twist and a 16" barrel. I've shot the 69gr Sierra MatchKings in Fiocchi and they do 0.75 MOA. The 77gr MatchKings didn't do so well, 1.5 MOA, plus the velocity is just around 2450 fps out of the short barrel. which ones are the light blue? I should have listed all 5. Bright green is 26.2 and 27.0 is light blue. Ligth blue was a nice symetrical group. It wasn't the smallest, however, and the two on either side were the largest. Definitely need to shoot some more or change powder for these bullets. Have you tried any Winchester 748 for lighter bullets? I have some W760 but no 748. I also noticed that Hodgdon doesn't list the use of W748 for bullets less than 50grains. Looks like you have a real challenge going on there slimjim. I also believe those 40's may be on the light side for your 1:9. But something else I would surely try, besides the variable powder charges, is to do a seating depth test with whatever charge seems to shoot the best. I have had some lighter .223 bullets that I could not get to shoot very accurately by just powder adjustments, but with some experiementing with the seating depths, I got them to shoot pretty good. Good Luck. No matter what, its still fun to get out and shoot. When a twist is too fast for a certain bullet, then just lower the speed, make it even a reduced load and it might become accurate. After seeing the math on speeding up the bullet to compensate for the wrong twist rate, I've concluded that although the statement is true the reality of making it work is another issue. If your going to slow it down why not take advantage of the heavier bullet in doing so. slimjim, hows your OAL in comparison to the factory stuff ?? ?